Last month Microsoft made the Windows 7 Release Candidate available free of charge with the intention that it will give Microsoft a chance to identity and iron out any bugs present before the final release.As you are all no doubt aware, Windows 7 is the successor to the somewhat criticised Windows Vista and is due for release in October of this year. The release candidate not only provides users with the ideal opportunity not only to get their hands on the software before it hits the shops but also provides what is essentially a completely free Operating System on a ‘try before you buy basis.’Of course, the product isn’t free for ever and in the second quarter of next year you will have to either purchase the finished version of Windows 7 or revert back to your previous OS. 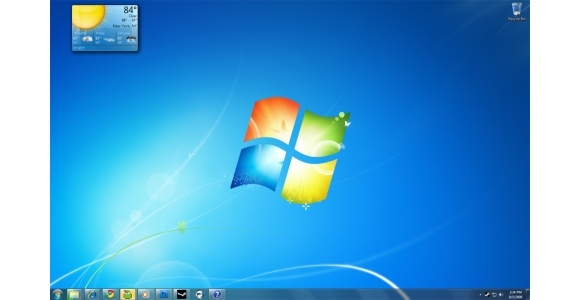 I did preview Windows 7 back at the tail end of last year and so to avoid any repetition please check out http://www.computerarticles.co.uk/windows-7/ to download a copy including a list of new features. Today I’m simply going to go through the process of obtaining and installing the release candidate so that you can experience these new features first hand.Before I do so it’s necessary to point out that a Release Candidate isn’t the finished version and as such you should install it in any ‘mission critical’ circumstances; ideally it would be on a PC that could be used solely for the purpose of testing where it wouldn’t matter if you had to reformat and start again.As with any major OS upgrade it would also be strongly advisable to perform a full system backup. So, to get started head to www.microsoft.com/windows/windows-7/download.aspx and select to download either the 32 or 64-bit version, depending on your CPU.If you are unsure then download the following free CPUID utility (www.cpuid.com/cpuz.php) and simply Google the CPU model number to determine whether it can support 64-bit and can therefore benefit from the more powerful 64-bit version of Windows 7.Incidentally, if you find (as I did) that your PC manufacturer installed a 32-bit Operating System on a 64-bit machine but you wish to install the 64-bit version of Windows 7, then you will have to do a clean installation from scratch rather than performing an upgrade. The installation file is actually a whopping 3GB in size and when the download is finished you will require a blank DVD, a DVD writer and some software designed for burning the .ISO file on to disc. I’m not going to cover the theory surrounding the handling of ISO files here so simply download the free CDBurnerXP (www.cdburnerxp.se), click ‘Burn ISO to Disc’, select the file you just downloaded and the software will then automatically create an installation disc for you to use. The upgrade disc can be used in two different fashions; either run it from within your current version of Windows to perform an upgrade (therefore retaining all your files and settings) or alternatively insert the disc and reboot the machine to load the installation files before Windows even loads, therefore facilitating a completely clean installation. If you require any further help during the installation process there is a guide available on the Microsoft website. Again I will reiterate that, because the software is both free and unfinished that you are very much on your own when it comes to any support.Once you have had chance to have a play around however please do let me know what you think.